I heard a story recently that I wanted to share. This was told by the youth pastor of our Church. They had two mice as pets, one was mocha colored (we’ll call him Mr. Mocha) and the other was black and white (let’s call him Mr. B&W). The mice spent the vast majority of their time in a cedar chip lined cage. They had their food and water provided for them, their cage was cleaned on a regular basis (room service) and they had a wheel to run around in for exercise. These mice had a really good life as far as mice were concerned. Mr. Mocha mouse in particular really liked to run in the wheel. He’d run in that wheel for hours, just spinning his time away. That seemed to be all that he did. Run in the wheel. Stop. Sleep. Go back to running in the wheel. Eat. Then back to running in the wheel. One day after being out of the cage for some petting and loving (yes, even mice need love) they put Mr. Mocha Mouse and his cohort Mr. B&W, back in the cage turned out the lights and went to bed. The next morning they came downstairs and noticed something different about the cage. It was empty! Both Mr. Mocha and Mr. B&W had escaped and were nowhere to be seen. Then they heard the wheel and saw Mocha mouse spinning around in his wheel which was now outside the cage and on the floor. 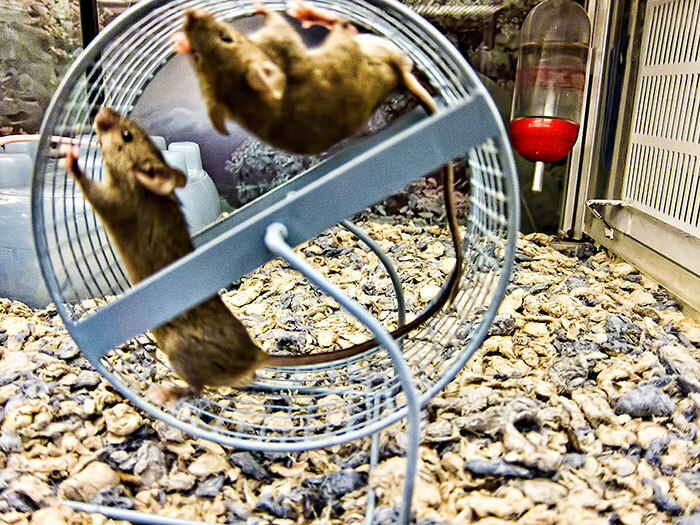 He had escaped his cage only to return to spinning away in his wheel. He had been given newfound freedom and what to a mouse would seem like the entire world to explore, but instead he went back to what he knew; which was running in the wheel. So what about the other mouse, Mr. B&W, the one with the aversion to the wheel? It wasn’t until several weeks later that they were watching TV when all of a sudden this silhouetted figure appeared in the corner of the screen. It was the long lost mouse who had somehow crawled up into the TV and was making his debut appearance on the big screen. He was living larger than life. This story really got me thinking about my own life. What have I been doing all this time? How many times have I been just like Mr. Mocha Mouse? I plan my big escape and when the opportunity finally presents itself I get scared and instead fall back to the safety and comfort of spinning away my years in my comfortable wheel. In my case however, the “wheel” I fall back to is the comfort of a secure job and life that while affording me security and all the “essential” things we are told to want and desire in life, doesn’t afford me spontaneity, adventure and challenge. Instead it just serves up days and weeks and months of mundane boredom. Each and every day looks just like the one before. I know exactly what to expect before it even arrives. It’s an unfulfilled existence. Some may say “Hey, that’s life!” I would argue that it’s “a” life but it’s not life. We can choose the life we want to live. We all have these opportunities to step out and do something amazing but we tend to let fear get in our way and never step outside of our comfort zone. So why have I continued to choose the wheel over stepping out? I think it’s because the wheel is easier. There is no risk involved with the wheel. I know exactly what to expect with the wheel. There is some level of comfort in not embracing change. I run and the wheel spins. There is nothing more. But as with the mouse wheel, it spins and it feels like I am getting somewhere but the scenery never changes. At the end of the day I am right where I was at the beginning of the day. It’s always the same. But then one day I stopped and asked myself “Do I like the work that I am doing?” I realized that for the most part I didn’t. What I needed to do was step out even though parts of me didn’t think I could do it. I needed to get busy living a great life and get past my inner fears that had been holding me back. This is when I decided to take a sabbatical, move overseas for a year for a change of location and pursue a few of my own goals and dreams. Will I find what it is that I feel is missing by taking this sabbatical? I don’t know. But I do know that if I keep running on my wheel like a mouse in a cage the scenery is never going to change. Are you spinning your wheel or making concrete plans to pursue the things you want to do? Great post man!! So true! I can totally relate! Love the Sabbatical idea!! I’m looking forward to continuing to read your stuff and get to know you!! Hey Josh!! Thanks man! It’s going to be an incredible journey for sure. Part of me is incredibly excited and another part is terrified. But I guess that is good. Looking forward to connecting up with you soon. What a terrific story, Matt. Sounds like it’s your time to be Mr. B&W! Good for you, for deciding to not let past patterns determine future moves. And many thanks to you, for the killer stuff you’ve been putting out! I’m really digging you’re writing . . . wish I could have been reading it ages ago. Hey Mark! Thanks so much! I’m definitely working on being Mr. B&W. It’s much more exciting and the scenery is better. Hey! You’ve been putting out some awesome stuff too. We need to meet up here soon. I’ll have to plan a trip north soon. I love this, Matt, and I’ll be watching you like a hawk. 😉 I did the same thing, albeit on a much smaller scale, when I left Oregon two years ago and returned to my home state. I thought I was prepared down to the gritty detail, I thought I had answered all the questions, thought I had facilitated myself into a new life . . . but the economy took a nose-dive just as I arrived here and I struggled for quite some time. Still am! I suppose one piece of advice I could share is ‘be prepared for the unexpected.’ Ya. Right. But, I’m learning that can only be in the moment with flexibility, patience and a creative mind. And alot of faith. And maybe some darn good friends. Anyway, thanks for sharing your journey. Inspiring! Cindy! You’re awesome! I love your story here if only for the fact that you applied action to a dream. I think that is really important and one thing that many people never do. A dream without action is nothing more than a dream. A dream with action applied to it is a real life. I’m going to need it all; flexibility, patience (who doesn’t when you have kids), creativity, good supportive friends (like yourself) and most important of all Faith. I don’t try and fool myself that there won’t be many unexpected twists and turns during this adventure but the thing I like to keep in mind is that we are doing this as a family so we always have that comforting piece of getting through the tough times together. I wish you nothing but the best for your own life journey. Let’s catch up soon!